Rural community projects across the Highlands are celebrated in The Highland LEADER Programme�s �Revitalising Communities in the Highlands� booklet launched at the full Highland Council on Europe Day earlier this month. Over 90 of the 358 local projects funded by the LEADER Programme are bought to life with quotes and photographs in the booklet. Featured projects range in location and type from the Isle of Skye Energy Advice Service, to Thurso Boating Pond Play Area, to the Black Isle Heritage Memories Project. 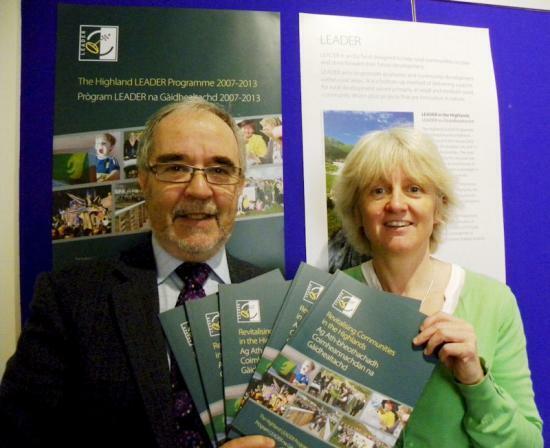 The booklet covers projects from all parts of the Highland area that are included in the LEADER Programme, which is the whole Highland Council region with the exception of the the Badenoch and Strathspey area which is included within the Cairngorm National Park�s own LEADER Programme, and the City of Inverness. Local people involved in the scheme were invited to tell their stories and the booklet is designed to show how different and distinct rural communities across the Highlands have been able to turn their aspirations into reality using LEADER funding, and are moving towards a confident and sustainable future. A full list of approved projects is provided at the back of the booklet which shows the total number, diversity and innovation of all the equal merit projects which have benefited from the �14,735,694 of approved LEADER funding across the Highlands. Councillor Thomas Prag, Chair of Planning, Environment and Development Committee at The Highland Council, said: �The figures and faces really speak for themselves: 368 projects have been approved and staff are processing and paying out on average �1 million worth of grants to local rural communities each quarter. This is a fantastic achievement. The new booklet will soon be distributed across Council offices and Service Points, libraries across the Highlands, and is currently available from the Reception of the Planning and Development Service at the Highland Council. LEADER is a European Union fund designed to promote economic and community development in rural areas. It offers a bottom up method of delivery aimed primarily to help fund small and medium sized community-driven projects that innovatively address local needs and help to realise local opportunities. The current Highland Programme (2007�2013) secured the largest allocation in Scotland: �16.5 million of EU funds (LEADER and Convergence). These funds are now fully committed across the Highlands and the Programme is not accepting any new applications. The Highland Council, on behalf of the Highland Community Planning Partnership, is the lead partner for the Highland LEADER Programme. The focus of planning and delivering LEADER is through 11 Local Area Partnerships. The LEADER Programme now forms part of the current Scottish Rural Development Programme (SRDP).The current LEADER is the fourth of its kind and builds on the successes of LEADER 1, 2 and LEADER+. It has been running since 2007 and will finish this year. It is likely that there will be another LEADER Programme for the period 2014�2020, and efforts continue to ensure that Highland communities would benefit from such a scheme. To request a copy of the new �Revitalising Communities in the Highlands� booklet please contact Planning and Development Service, The Highland Council, Glenurquhart Road, Inverness, IV3 5NX.